The picture above is in my garage. No comments on the cleanliness please…. The mass of fur, synthetic materials, plastic and metal you see on the left hand side of the image are flies. These are bugs that have been used locally on bass ponds, small creeks or further afar. They’ve been brought home crushed in the bottom of a bag, stuck on my car dash or as dry/dropper rigs wound tightly around one of my wide-brimmed hats. 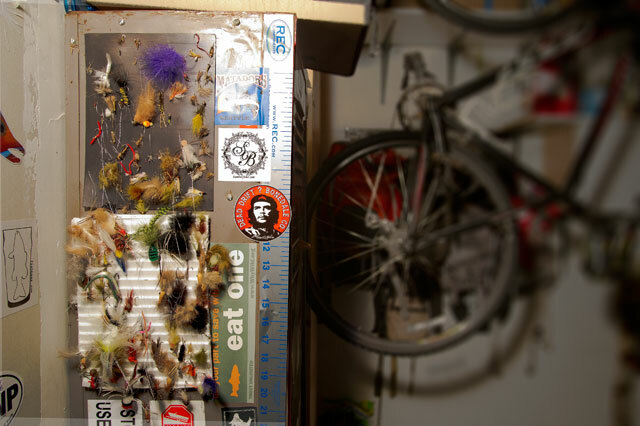 You may have this problem too—flies you’ve used that haven’t quite made it back to the box yet. Why not take your procrastination to the next level and build a little shrine to the bugs who’ve done your dirty work without complaint? I’ve found that sticking ripple foam (for the bigger bugs) and a large sheet magnet (for the smallish ones) to the the wall lets you throw those misplaced and still-rigged flies somewhere until you can deal with them in a more organized fashion. I mean, who wants to sort the bass bugs from the size 22 emergers when you roll in at 11pm at night from a trip? Simply stick ’em on the wall and deal with them later. It’ll keep the bugs from spending months in a forgotten, tangled mess, where they are likely to rust and lose shape, and it’ll provide you quick access to some flies you know have worked before.